that address unique learning needs of working professionals. Human Resource Management is vital in project management and so it is, one of the ten knowledge areas as per PMBOK Guide. It is all about managing human resources or employees in an organization to maximize their performance and multiple company growth. 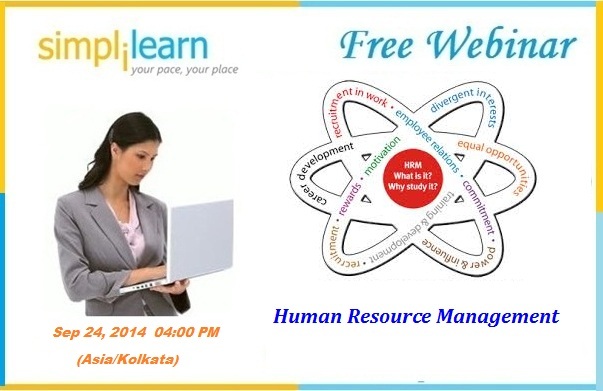 During this webinar, you will learn how to manage human resources in projects. The key thing about Human Resource Management is that each of the Project team members should have clear assignment of their roles and responsibility to avoid any ambiguity. Develop Human Resource Plan: Develop Human Resource Plan is the process of defining the detailed roles and responsibility of each of the project team members. Hurry and enroll for this free online project management courses session. Enroll early to confirm your spot. Feel free to refer your friends or co-workers for this Online Project Management Free webinar. Kindly Note: Only Register participants will receive an unique link 24-48 hours before the schedule time of webinar which will allow you attend the webinar. We look forward to having you join us at an upcoming Webinar event!! !